We’re reviewing the presentations and closing panel from the afternoon of TADSummit Day 2 in this weblog. The morning of TADSummit Day 2 is reviewed here (sponsors’ keynotes and MONeH Showcase). The second half of the afternoon of TADSummit Day 1 is here (service innovation and evening workshop), the weblog covering the first half of the afternoon is available here (service innovation with programmable telecoms), Day 1 morning sessions are available here (welcome and innovation showcase) and here (sponsors’ keynotes). The agenda is here. TADSummit is the telecom service innovation event, in its 5th year, it brings the programmable telecoms industry together to share insights, best practices, and help build an open global ecosystem. Thomas is involved in many interesting projects. He leads the Fort Lauderdale Machine Learning Meetup. His current focus is machine learning. His work is not hyped up AI jabber, rather the focused application of the latest cognitive computing projects to telecoms. Cognitive Computing seems to be taking over the world. The technology is helping identify illneses, composing music, driving cars, and the list goes on. In this talk we explore how it is impacting telecoms. Google has created an immense valuation using your search information, but its without context and meaning. Search for an item and you’re blasted by webpages full of the same advert for that item. It lacks context and meaning. While all the conversations businesses have with their customer are full of context and meaning that simply go to waste. And will not be used to fill webpages full of the same advert. Cognitive telecom services has massive potential, and the technologies and necessary price points are only just falling into place. RestcommONE is Telestax’s CPaaS enabling technology. It provides REST APIs and a visual design tool with drag­and-drop programming capabilities for building real­time messaging, voice and video applications and services. The platform supports cloud, on­premises and hybrid deployment configurations. Greg shared the experience of the real difference between cloud and on-premises deployment. Can businesses program, or even own, their own cellular infrastructure? Many aspects are making it much easier, with shared and unlicensed spectrum for private LTE, small cells, virtualised networks, programmable eSIMs and more numbering/identity options. Some industries have their own unique wireless needs, either across the wide area (eg utilities) or on major sites (oil & gas, airports etc) that are not easily-addressed by traditional telcos. Can they build and/or operate their own networks? Is this the ultimate “developer” play? Given the MONeH Showcase and the Patrice Crutel’s presentation from the morning, this is becoming an interesting area beyond traditional specialized enterprise wireless networks. To more general enterprise scenarios and enterprise-focused service providers. Could mobile network operators become not only the service provider of last resort, but also the network provider of last resort? With the proper configuration and knowledge it is possible for a service provider to anticipate why a customer is calling and proactively initiate actions – even before the agent says “hello.” This talk will include several examples of what is potentially possible when you combine contextual information with a customer call. Progress Report on the Decentralized Web by David Dias, P2P Software Engineer at Protocol Labs. Secure and robust access to information, to communication, and to computing has become a critical part of what it means to be a human. The internet has become the main vehicle for human interactions worldwide, and it will only become more so as our devices and interfaces improve. Protocol Labs is focused on the evolution of the internet through decentralize web projects. At the heart of computing progress lies a simple process: the research, development, and deployment cycle. Protocol Labs accelerates the ideas-to-superpowers pipeline through its projects, which is closely aligned to the approach of TADHack and TADSummit in moving ideas to reality. 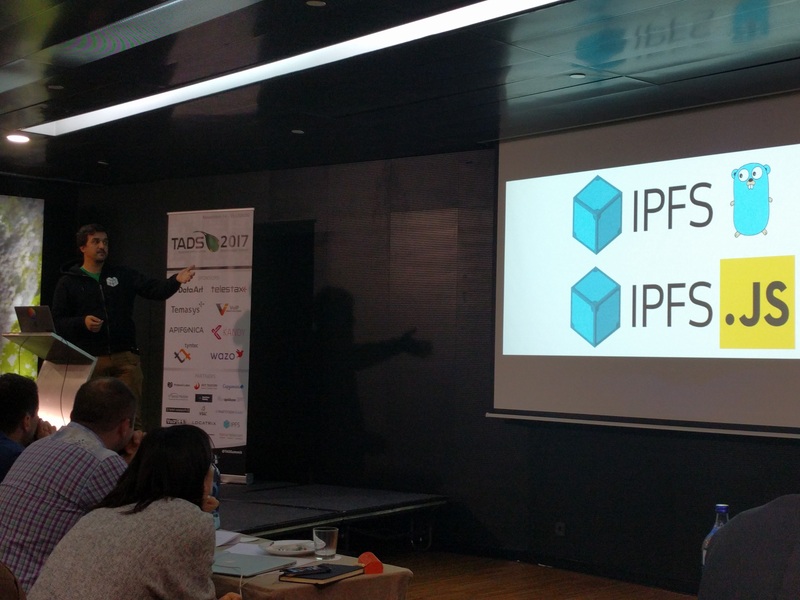 We’ll focus on two of the Protocol Labs projects, the InterPlanetary File System (IPFS) that enables the creation of completely decentralized and distributed applications. And Filecoin a cryptocurrency powered storage network. Sharing the latest results and its impact for Programmable Telecoms. In just 2 days we saw more new ideas and thought leadership than at any other telecom event. This panel helped explain what it all means for 2018. Now, the panel did get a little side-tracked as I was presented with an award for my work on TADS over the passed 5 years. Thanks to everyone for the recognition. In the comments the panel and audience valium over the counter made you can see we’ve created an open, honest and friendly ecosystem, focused on growing programmable telecoms. In a separate weblog we’ll review in more detail the insights of TADSummit. Two themes that popped up across several presentations were: firstly, the convergence of CPaaS, UCaaS, and off-the-shelf service delivery. Making it easy for enterprises to consume services, configure, customize, and integrate into their business. Secondly, the emergence of private mobile networks, where enterprise-focused service providers and enterprises themselves can now own private mobile network. We’re at the start of this trend, but the building blocks of technology and spectrum are mostly available. There were many other insights through TADSummit, security around A2P conversational CRM, security in virtualization, automation of VNF testing, emerging opportunities in cognitive telecoms, importance decentralized web will play in programmable telecoms, the composition of services into solutions for specific business problems as shown by Veeting, enterprises hacking on programmable telecoms and implementing those hacks themselves in months. There’s a slow change happening that has been a trend for decades, but is now accelerating and changing behaviors. Its the assembly of technologies into solutions. As a specific example, today I can with my 7 year old son do computer control projects I once did in my 1st and 2nd year engineering degree, like a linear stepper motor controller. At TADHack people can create solutions in 24 hours that can scale nationally. Its not really about the technologies: cloud, APIs, containerization, open source, cheap easy to use processors, machine learning services, GUI app development (IBM Bluemix) – they will keep on coming. Its students coming out of universities and people focused on continuous learning being able to achieve as a small group what once took large corporations – most of the start-ups involved in TADS are examples. We’re only scratching the surface of this means and the people and processes need to catch up what technology enables wrt assembly. Examples of its impact are, we no longer wait for the next big release of product X (e.g. MS Outlook) anymore, we fill in the gaps ourselves in days. An enterprise focused maker industry, quickly solving problems, by building on the shoulders of giants. Build a manageable version of Slack on Wire or Matrix. Add an omni-channel bot on your FAQ in hours not months, then use the interactivity of the bot to build a better FAQ (with human control of the improvements). In the future telcos will continue to exist, regulators will still exist, Oracle will still exist, as will Google, and Amazon. I really hope Facebook will go away, its the web-version of opium for too many people. Not only is telecoms becoming democratized, but more broadly technology and its assembly into solutions by many more people and (albeit slowly) processes are getting democratized. Telecoms is the glue between people and things (devices and enterprise applications), its the hot-glue gun of the enterprise focused maker industry. The tricky part for all of us is finding the opportunities this gradual trend creates. TADHack is the largest global hackathon, its focused on programmable telecoms. Its a celebration of developers, creativity and technology. TADSummit has become the telecom innovation event, it brings the ecosystem together for a practice-focused discussion on programmable telecoms. Telecoms is now democratized, anyone with web skills can now use it in their applications, services and business processes. In 2018 we will be partnering with Enterprise Connect once again to run TADHack-mini Orlando, just before the conference. Hacks will be presented in the main conference. We may also run a TADHack-mini just before IAUG (International Avaya User Group) in New Orleans in January. We’re also considering mashing up TADSummit and TADHack to bring more and more people into the hackathons and expand the reach of TADSummit around the world. TADHack sponsors walk the talk, they have confidence in their platforms to stand shoulder to shoulder with competitors and partners. TADMentor announced last year continues to grow, with over 2000 people involved (10 times last year). The cPaaS market is consolidating and becoming more service focused to expand its addressable market. Telecoms continues its democratization, which impacts developers, enterprises, consumers, and the traditional telecoms ecosystem. Its an exciting time to be in telecoms, and we’re only just getting started!